A view of the Pobalscoil Chorca Dhuibhne jersey. 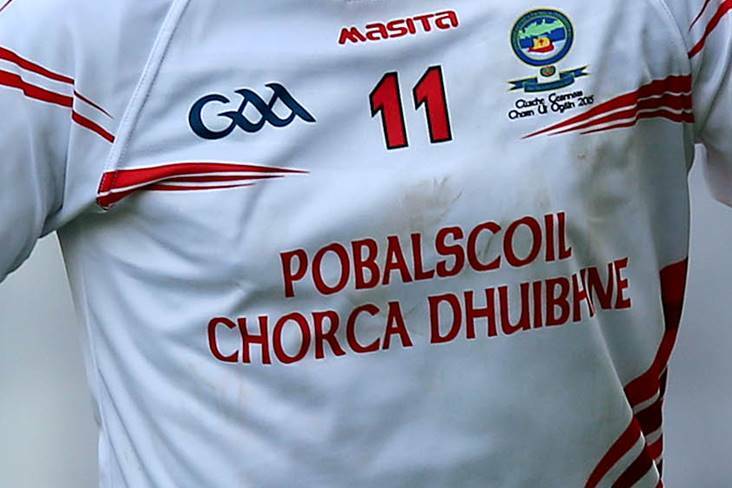 Pobalscoil Chorca Dhuibhne has lodged a complaint with the GAA claiming that one of its players was subjected to racist abuse during their recent All-Ireland College SF ‘A’ semi-final defeat to Naas CBS. Speaking to the Irish Independent, former Kerry senior football manager Eamonn Fitzmaurice, who is the Dingle school’s principal and football team manager, confirmed that they had sent a letter of complaint to the GAA’s Post-Primary Schools committee. He was keen to emphasise that the alleged abuse had come from “an element of the supporters” and not any of the Kildare school’s players. He also explained why they had waited until after last Saturday’s Hogan Cup decider, which Naas lost to St Michael’s of Enniskillen, before bringing the matter to the attention of the authorities. “We had been beaten fair and square by the better team on the day. We just wanted to have our facts straight. “I was at the far side of the pitch. I was aware that the Naas CBS supporters were very noisy but that wouldn't be very unusual at schools matches. There would always be a good atmosphere. “It was after the game that I was made aware that there was a racist element to some of the chanting, not all of it. “It definitely wasn't anything to do with the opposition players. “It very much came from an element of the supporters, not all of them, it should be pointed out. “It is not something we have encountered before.